Welcome to Walk for ME 2019! 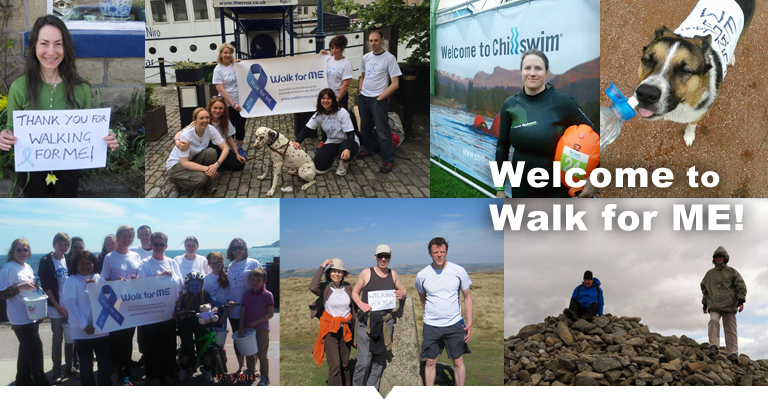 Since May 2013, Walk for ME has seen amazing people do sponsored walks, swims, runs and rides across the UK, Ireland, the Isle of Man, France, Germany, Spain, Malaysia, Australia, New Zealand and both coasts of America. To date Walk for ME has raised over £120,000 including gift aid. Wherever you are we hope you or your family and friends will get involved this year! The original idea behind Walk for ME was that friends, family and loved ones of an ME sufferer do a sponsored walk on their behalf: hence the name Walk for ME or Walk for me. However as well as walks we have had healthy friends and families of ME sufferers do swims, rides and runs! It is hoped that as many friends and loved ones as possible will do a sponsored walk or other fun event during ME Awareness Week which runs from 6th May to 12th of May. A significant number of people with ME/CFS are bed-bound, house-bound or can only walk short distances. One of the tragedies of ME/CFS is that it is effectively an invisible illness as so many are too ill to work, raise awareness of the illness or raise money for research. We hope Walk for ME can help address all these issues by raising awareness and vital funds for research into ME. We hope this will be a fun but poignant event. Family and friends can choose to walk any distance they choose; it could be 1 mile, 5 miles, or 10 miles or whatever feels appropriate. Alternatively they can choose to swim, do a run or go for a ride. The whole idea is that the friend or family member is doing something that their loved one would love to be able to do but can’t. We really hope that by doing this on their behalf and raising sponsorship money it will help raise awareness of this debilitating illness. People with ME often have friends and loved ones saying they feel helpless and they wish there was more they could do to help. This is their chance! Click here for details on how to get involved, or here to go directly to our JustGiving page and join our team.